Dr. Anton Reece, left, and Dr. Bob Jackson shake on schools' agreement. PADUCAH, KY (04/10/2019) An articulation agreement between Murray State University and West Kentucky Community and Technical College was signed April 9 that will provide WKCTC students who have earned an associate's degree a seamless transfer process into Murray State's nonprofit leadership studies program. 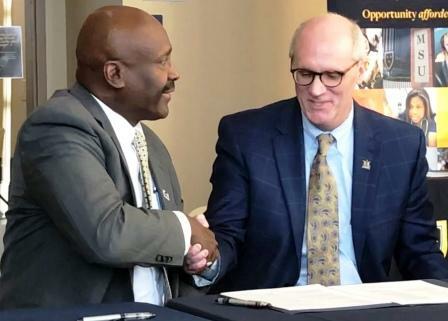 Administrators, faculty, staff and students attended the signing at Murray State University's Paducah Regional Campus as Murray State University President Dr. Bob Jackson and WKCTC President Dr. Anton Reece signed the agreement. "The articulation is a testimony to the commitment of Murray State and WKCTC to the economic development of our region, and the nonprofit leadership studies program provides an ideal bridge between our learning communities and the communities of practice engaged in improving the quality of life in western Kentucky," said Dr. Peter Weber, director of the Murray State University nonprofit leadership program. "This is another step in our partnership with Murray State University and our regional outreach to help our students find success through coursework in business, criminal justice and a substance abuse recovery coach to finish an associate degree and complete a four-year degree." said Dr. David Heflin, WKCTC vice president of academic affairs. "We're excited and look forward to more memorandums of agreement that will benefit our students as they continue on their educational pathway." Murray State University's nonprofit leadership studies program is committed to building a coordinated response to growing educational, research, and service needs of organizations dedicated to improving the quality of life in communities around the world. The program offers a broad-based approach to the development of the future leaders of the nonprofit sector through undergraduate and graduate degrees, as well as leadership, networking, funding and promotion of quality practice. "The articulation reflects the growing demand for professional training in leadership and management of nonprofit organizations," Weber said. "According to the most recent data available, there are over 19,000 nonprofits in Kentucky and over 19 percent of recent postsecondary graduates held positions within these nonprofits. The nonprofit sector is one of the largest employers, both regionally and nationally, and this articulation thus provides pathways for employment in a dynamic and meaningful labor market." "The desire to give back and help others is so strong amongst WKCTC students," McGuillion said. "This agreement is an exciting opportunity for our students who want to be part of a nonprofit organization and now have this educational pathway to a bachelor's degree. I am grateful for another transfer opportunity for our students with Murray State University. We are both committed to student success." About West Kentucky Community and Technical College (WKCTC): West Kentucky Community and Technical College has been recognized as an Aspen Prize Top 10 Community College four times by the Aspen Institute and has twice been named a Finalist With Distinction for providing students with strong job training and continuing higher education opportunity, for achieving high completion and transfer rates, and for providing strong employment results for its graduates. For more information, visit westkentucky.kctcs.edu. About Murray State University: Murray State University provides an "Opportunity Afforded" for students through a high-quality education with experiential learning, academic and personal growth and the ability to secure a lifetime of success. Since 1922, the true value of higher education has been found at Murray State University, where our commitment is to afford endless opportunities for developing leaders in the community, the country and the world. The University's main campus is located in Murray, Ky., and includes five regional campuses. For more information about Murray State University, please visit murraystate.edu.